Tablet PC is a commercial and education reseller for Microsoft Surface devices like the Surface Pro, Surface Book and the Surface Studio. Our people use the Surface Pro and Surface Book in and out of the office. 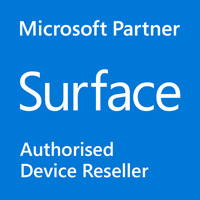 If you're looking for a Microsoft Surface for your business, talk to the experts. Tablet PC also offers exclusive Microsoft Extended Warranties that you won't get at retail outlets. We can get special pricing and resources for your project no matter how big or small. Which Microsoft Surface is for me?